Riccardo Chailly was not scheduled to take over fully at La Scala until 2017 when this performance was recorded in 2015. It was the chosen opera staged for performance to attract the visitors to the Expo Milano held from May to October that year. With Chailly renowned in Puccini the composer was a shoe in and Turandot was seen as having worldwide appeal, at least since its tenor aria was featured at a football tournament and by three of the greatest tenors of their generation. But as to why La Scala, the City Fathers, or the conductor himself, chose to resurrect this 2002 production by Nikolaus Lehnhoff I do not know. I surmise that it could be that Chailly knew that particular production from conducting its première at The Dutch National Opera in 2002 and that it involved use of Luciano Berio’s then recently completed edition of the opera’s last act. This replaced that by Alfano who, at Toscanini’s instigation, had written music for the uncompleted score. As is well known, Puccini died before completing the composition despite having worked on it for five years. However, he left sketches for the missing act three. At Toscanini’s encouragement Alfano wrote the completion that became the norm in theatres around the world. Using the same sketches Berio wrote a completion significantly different in patina and complexity from Alfano’s. This completion received its world première shortly before this production was staged in Holland in 2002 under Chailly’s baton. The occasion of the La Scala opening night recorded here was the first time that Berio’s completion had been seen in Milan. As well as the dramatic softening of the closing climax, before which Turandot had removed her crown and kissed Calaf, the patina of the music has a distinctly different feel to that we are used to in Alfano’s conclusion. This is hardly surprising given the evolution of classical music, especially opera, under the influence of Richard Strauss and other even more radical composers, between him and Berio. The set is nothing like the Zeffirelli realistic and picturesque confection that is the Met production, seen on HD Live Transmission on January 30th 2016 and also featuring Nina Stemme in the title role. 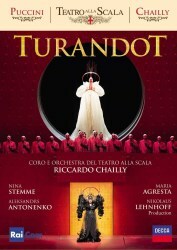 It is featured on DVD with Domingo as Calaf and Eva Marton as Turandot. Recorded in 1988 it is in 4:3 visual aspect. (DG 073 058-9). In this staging Turandot’s palace is an austere red structure seeming to be half rising and half suspended from the stage. Ping, Pang and Pong are costumed like clowns, or comedia dell'arte characters, and act so on occasion and whilst, regrettably, being of little vocal distinction. The principal singers are variable. I personally find less quality than I might have hoped for, or expected, for such a special occasion. In the eponymous role Nina Stemme is distinctly steely in vocal tone, certainly more Wagnerian than Italianate and is vocally stretched on occasions. The Latvian Aleksandrs Antonenko’s soft-grained tenor de forza lacks the vocal bite the role requires, albeit not the high notes, and is occasionally drowned by the orchestra. Of the leading soloists Maria Agresta as Liu is by far the best as a singer and actress, a fact recognised by the audience applause at the end. Carlo Bosi’s Altoum is sonorous and convincing. Chailly’s long stay at Bologna, and conducting elsewhere, has already established his reputation as a Puccini expert. Consequently there are already plans afoot for him to conduct and record a cycle of Puccini’s operas at La Scala in the coming seasons. As it was on this occasion, and for whatever reason, the orchestral contribution under his baton was somewhat under par. He will have some work to do, I suggest, to bring the orchestra back to the standards it exhibited under Abbado and, on occasion, Muti.